City planners and community stakeholders gathered recently to design plans for developing underutilized properties in the South Side neighborhoods of Silver City and Clarke Square. 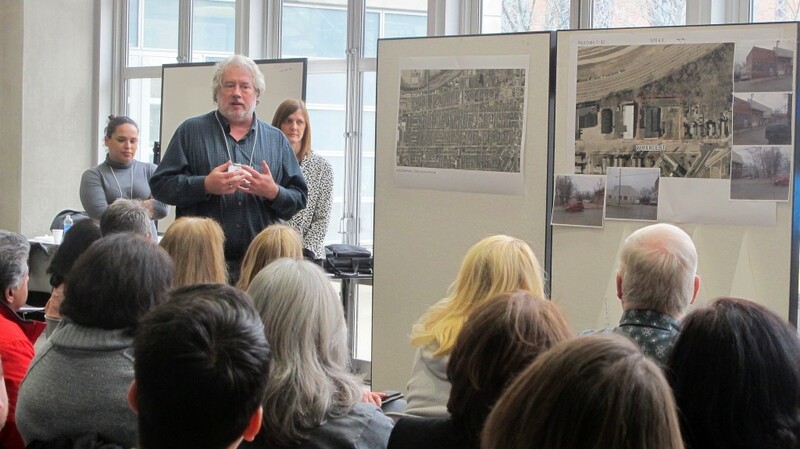 Carolyn Esswein, director of Community Design Solutions and a faculty member at UWM’s Department of Urban Planning, helped facilitate the daylong meeting, which took place at the UWM School of Architecture and Urban Planning. “This [charette] could be a model for the city,” said Esswein, who explained that other Milwaukee neighborhoods also are looking for ways to repurpose vacant or underutilized buildings. Vanessa Koster, planning manager at the Milwaukee Department of City Development, added that the Silver City and Clarke Square charette could be replicated in other commercial corridors and business improvement districts that want to preserve buildings while also improving the potential for economic development. The charette focused on six sites: 3514-3528 W. National Ave., 3733-3737 W. National Ave. and 3220-3238 W. Pierce St. in Silver City; and 2110-2134 W. National Ave., 2127 W. National Ave. and 2008-2034 W. Greenfield Ave. in Clarke Square. During the session, six architectural firms worked on plans for a specific site. In the morning, the architects brainstormed and drafted proposals, which were then presented to the audience. City planners and residents offered critiques that were incorporated into the designs. “This [charette] helps make sure that real estate development happens in a responsible and community-supported way,” said Ian Bautista, executive director of Clarke Square Neighborhood Initiative (CSNI). Bautista was enthusiastic about the ideas for the sites, which included plans for community kitchens, coffee shops, indoor recreation facilities and housing developments. Alex Van Osten and Tom Joy, project designers at Korb Tredo Architects, were assigned the site at 3733-3737 W. National Ave., where they proposed a mixed-use development that focuses on a ground floor community kitchen with apartments on the second floor. Van Osten explained that it was their first time attending the charette, although their firm has previously participated. “It’s been great to talk to people from the communities,” added Joy. Other participating architects included American Design, Miller Architectural Group, Arcint Architecture and Hofman Architects, Quorum Architects and Engberg Anderson. “We’re here for a marketplace of ideas,” said Rocky Marcoux, director of Milwaukee Department of City Development, who stressed the importance of hearing the needs of the neighborhood stakeholders while making strategic decisions for Milwaukee’s future. 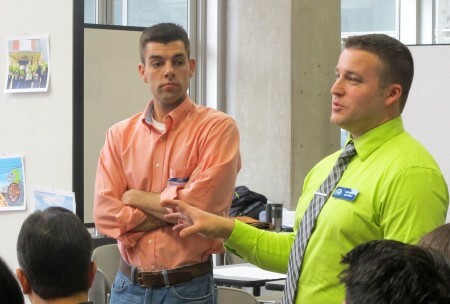 Gino Odasz, a freshman at Escuela Verde, attended the charette with fellow students and his advisor, Joey Zocher. “In the future, I’m thinking about being an architect, so seeing this was cool,” said Odasz, who was excited to hear the proposals for the area near 3628 W. Pierce Street, which is the new location of his public charter school. This was the fourth charette hosted at UWM that focused on economic development opportunities in Milwaukee. Past charettes have helped develop plans for Bronzeville, Martin Luther King Drive and Riverworks. When Alderman Bob Donovan saw the success that stemmed from the previous charettes, he suggested that LBWN and CSNI follow suit. The Zilber Family Foundation, the Milwaukee Department of City Development and LISC Milwaukee helped fund the charette. “We want to continue to build on the momentum and assets of these two neighborhoods,” said Martinez, who expects to release a final report in January or February detailing what plans from the charette will be pursued. Fantastic way to bring resources together! Looking forward to more of this in the future.